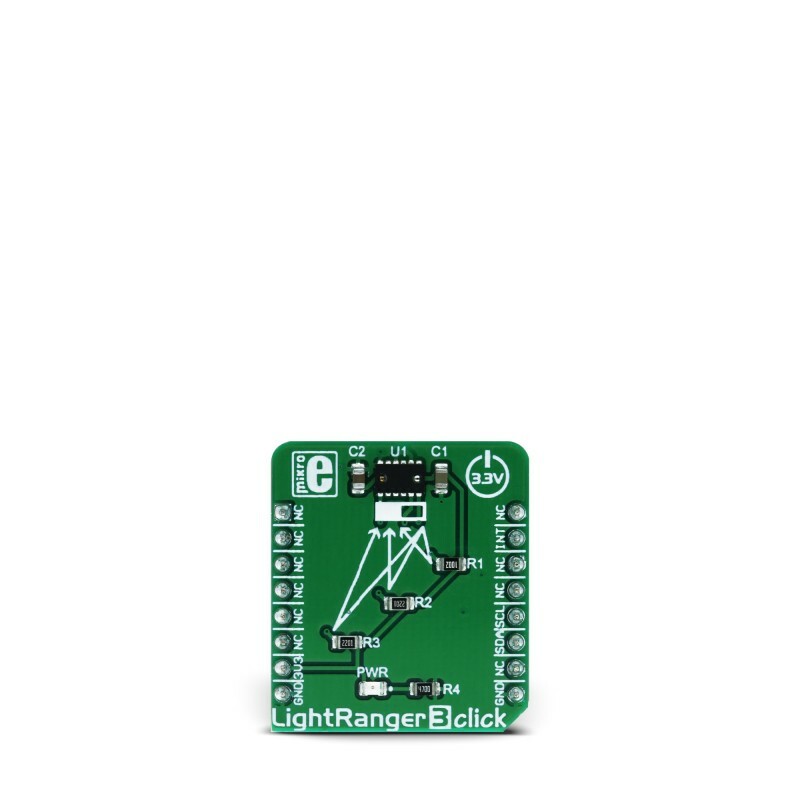 Light Ranger 3 click is an accurate distance measurement Click board™ based on a ToF (Time of Flight) measurement principle. The Simblee™ enabled RFD77402 rangefinder module from RF Digital is a complete measurement stack on the chip. It is surprisingly easy to work with, as this highly integrated range finder module exposes the only I2C interface and INT pin to the host controller. It features the VCSEL, a Vertical Cavity Surface Emitting Laser, used to emit a narrow band of a harmless modulated light beam in the IR range (850 nm), and a receive sensor, which can detect the reflected light. It can measure distances up to 2000mm, with up to 10% accuracy. The device is rated Class 1 LASER product, operating in the IR (invisible) spectrum range. ToF based light distance meters and rangefinders are one of the most accurate contactless distance measuring devices. 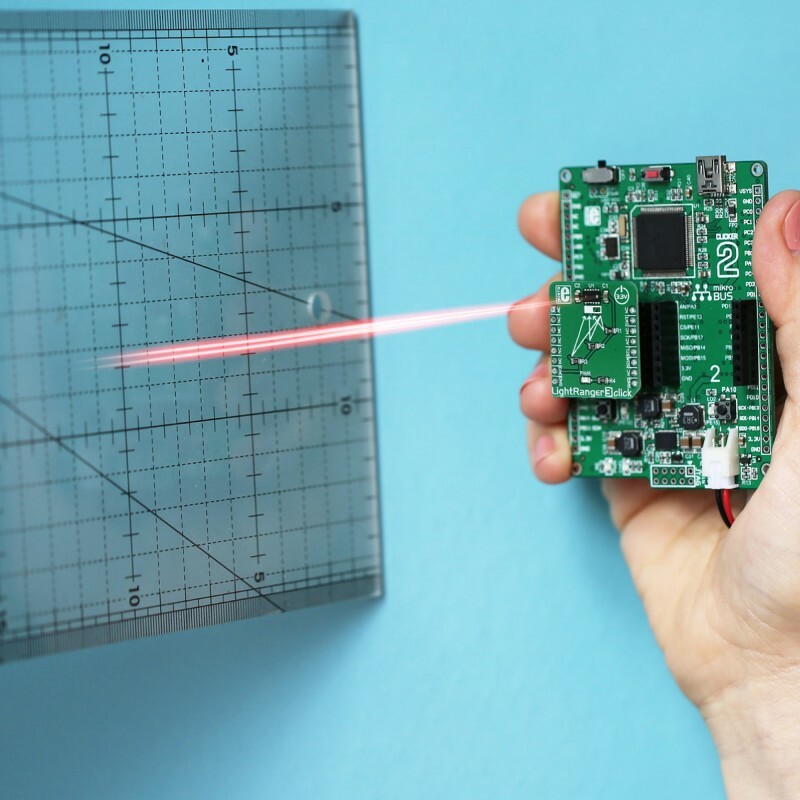 The ability to precisely measure distance without making actual contact, allows Light Ranger 3 to be used in industry - for counting dimensions of goods in industry, controlling a safety area, building contactless digital measurement tools. Some other uses for this device could be building 3D visual guidance applications in robotics, for moving it through obstacles, and similar. 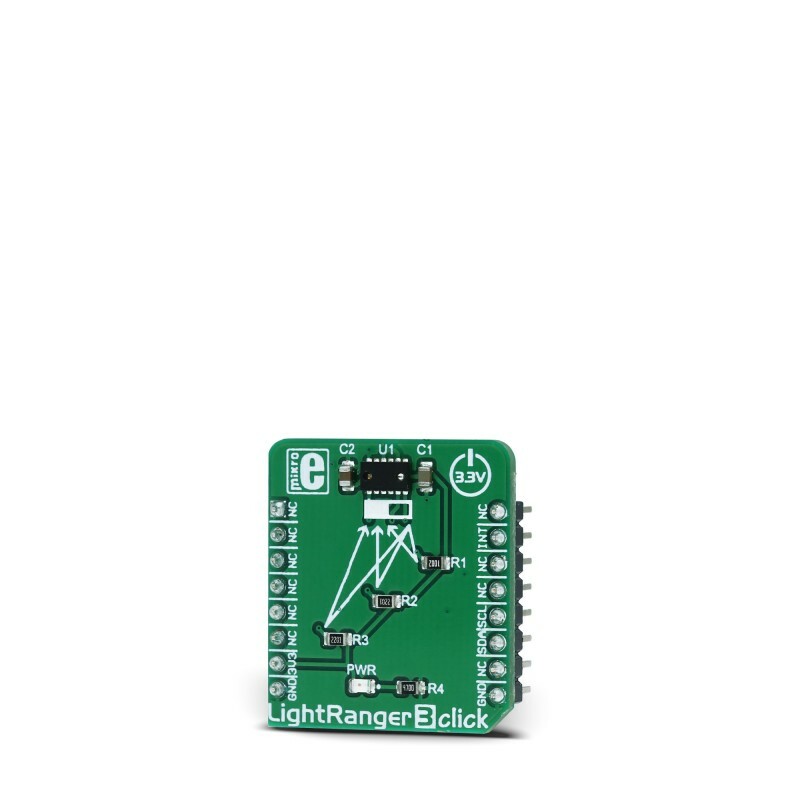 Light Ranger 3 click uses the Simblee™ enabled RFD77402 ToF sensor module from RF Digital. This sensor uses the VCSE (Vertical Cavity Surface Emitting) narrowband LASER, which emits light in the range of 850 nm. The light emission is in the IR range of the spectrum and it is not visible by a human eye. 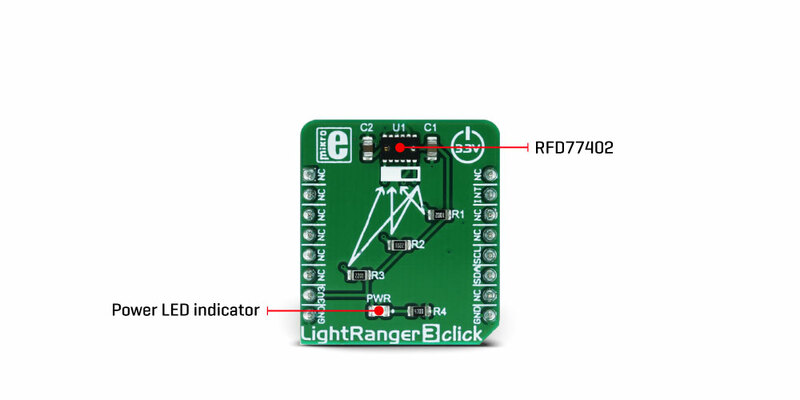 It is received by the IR sensor and processed by the integrated sections of the RFD77402, giving an 11-bit result on the output register, available via the standard I2C interface. The device is rated as Class 1 LASER product, and it does not cause harmful eye injuries. However, it should not be pointed towards the eyes. The highly integrated RFD77402 ToF sensor encompasses several integrated sections. It has an embedded MCU, OTP memory, RAM area, ranging processing unit and the VCSEL driver. It exposes a simple I2C interface for the communication with the host MCU, offering a range of registers, used for configuring and status reporting. In addition, it offers an interrupt pin (INT) routed to the INT pin of the mikroBUS™. Highly configurable interrupt engine allows this pin to be configured to generate interrupt signals for various events, alerting the host MCU about some important status changes, such as the Data Ready event, for example. It can be set to work in both open-drain configurations, as well as in the push-pull mode. The Click board™ is equipped with the 10K pull-up resistor, so it is advised to configure the INT pin in open-drain mode. 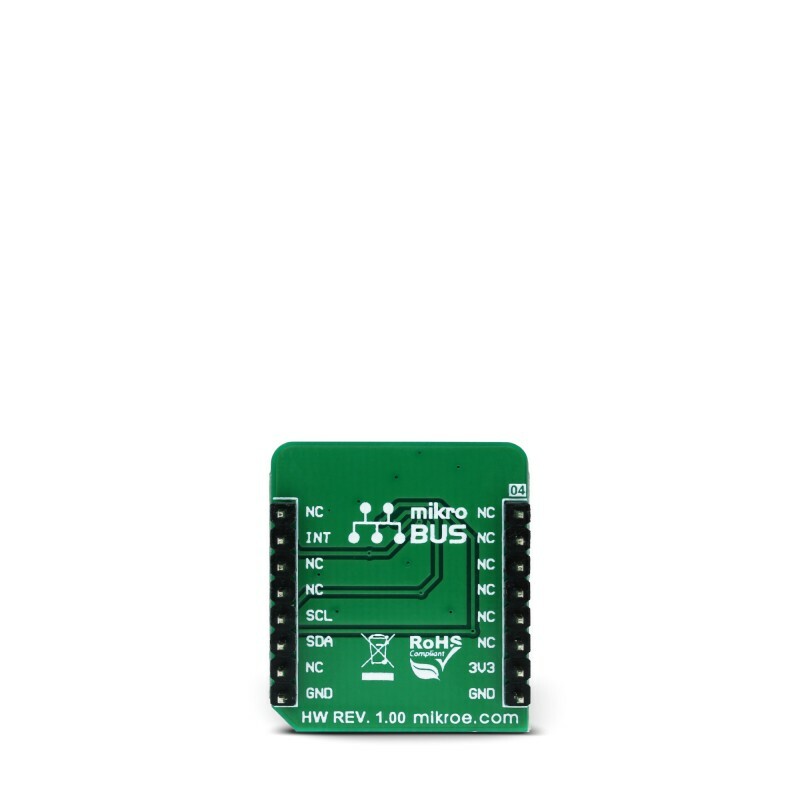 The Click board™ uses only 3.3V power rail from the mikroBUS™. No additional jumpers or selectors exist on the Click board™ since the RFD77402 ToF sensor module is highly integrated and requires a minimum number of external components to work. The RFD77402 module datasheet offers an extensive information about internal registers and how to configure them. However, the click comes with the library of functions that provide simplified operation and measurement. The use of these functions is demonstrated in the example, which can be used as the reference for custom design. This table shows how the pinout on LightRanger 3 Click corresponds to the pinout on the mikroBUS™ socket (the latter shown in the two middle columns). We provide a library for the LightRanger_3 Click on our LibStock page, as well as a demo application (example), developed using MikroElektronika compilers. The demo can run on all the main MikroElektronika development boards. The library initializes and defines the I2C bus driver and drivers that offer a choice for writing data in registers and reading data from registers. The library includes functions for full initialization chip with the procedure is written following the instructions from the datasheet. The user has the functions available for softReset, read distance and confidence distance value, Then functions for go to standby mode, go to off mode, go to on mode and measurement mode. The full application code, and ready to use projects can be found on our LightRanger 3 click LibStock page.